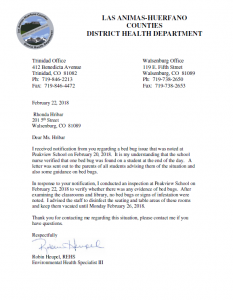 I received notification from you regarding a bed bug issue that was noted at Peakview School on February 20, 2018. It is my understanding that the school nurse verified that one bed bug was found on a student at the end of the day. A letter was sent out to the parents of all students advising them of the situation and also some guidance on bed bugs. In response to your notification, I conducted an inspection at Peakview School on February 22, 2018 to verify whether there was any evidence of bed bugs. After examining the classrooms and library, no bed bugs or signs of infestation were noted. I advised the staff to disinfect the seating and table areas of these rooms and keep them vacated until Monday February 26, 2018. Thank you for contacting me regarding this situation, please contact me if you have questions. JMHS students and faculty are to be commended for a great number of students making the Purple/White Honor Roll, Principal’s Honor Roll and the 4.0 Superintendent’s Honor Roll. Congratulations for the determined effort and character traits that you have displayed over the 1st semester enabling you to achieve to such a high level. I am proud of you and encourage you to continue excel. Feb. 15th Parent Teacher Conferences reminder: Student release time on Thursday, Feb 15th will be at 2:30pm. Conferences begin at 3:00 and end at 7:00. Parents, please make every effort to attend because it is never to late to be the key to your child’s success story. I hope you have a valuable, insightful interaction with your child’s/children’s teacher/teachers. http://alrt4.me/Pet4 All Huerfano re-1 schools will be in session tomorrow operating as normal. Any threat has been resolved. It is safe to attend. (For Mon. Feb 5th) Walsenburg Schools (John Mall and Peakview) Closed due to a credible threat that could pose a safety risk. Gardner School will operate per a normal schedule. Students will be released at 3:05. Peakview and John Mall high school are on Lock Out status. Students are moving freely within the buildings and their classrooms, running their normal schedules. Release time will be at the normal time. Parents are asked to not come to the school to pick up children at this time, as you will not be allowed into the buildings.